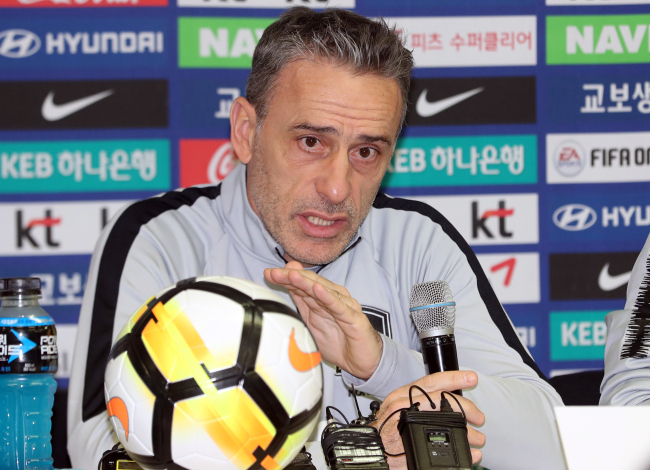 CHEONAN, South Korea -- South Korea football coach Paulo Bento on Monday hinted at making lineup changes for an upcoming friendly match against Panama. South Korea, 55th in the latest FIFA rankings, will face 70th-ranked Panama, at Cheonan Stadium in Cheonan, South Chungcheong Province, on Tuesday. The two sides are meeting for the first time. Since he took the helm in August, Bento has been sticking to a 4-2-3-1 setup and has used the same back four comprised of Lee Yong, Jang Hyun-soo, Kim Young-gwon and Hong Chul in the last three matches. “I can say that there will be some changes in each position for tomorrow’s match,” Bento said at a press conference in Cheonan. South Korea have yet to suffer a loss under Bento. The Taeguk Warriors started with a 2-0 win over Costa Rica and had a 0-0 draw with Chile last month. They beat Uruguay 2-1 in a friendly match in Seoul on Friday. Although Panama are considered weaker opponents than previous teams, Bento said South Korea will not let their guards down. The friendly against Panama is the last home match in this year and also South Korea’s last opportunity to test their tactics with Tottenham Hotspur star Son Heung-min. The Korea Football Association and Tottenham previously agreed not to play Son for South Korea’s November friendlies and the first two matches at the Asian Football Confederation (AFC) Asian Cup in January in a trade-off for the players’ Asian Games appearance this summer. Son, who serves as the team captain, missed penalty kick opportunities in the matches against Costa Rica and Uruguay. Bento said he has not given any special words to Son for his performance. Against Uruguay, Bento used Kim Seung-gyu as the team’s starting goalkeeper ahead of Jo Hyeon-woo, who was South Korea’s No. 1 custodian at the 2018 FIFA World Cup. Bento didn’t reveal whether he would start Jo for the Panama friendly, but he thinks it’s positive that the team is growing with healthy competition between the players.